When considering what to cover in my first blog post, I kept coming back to topics related to spread trading. As a former full-time trader who made a living formulating and executing spread strategies, and as the person who leads the product management function for proprietary trading at TT, which includes automated trading, I think a lot about themes related to spreading. TT’s Autospreader is one of the most widely used spread tools largely because it delivers sophisticated functionality and extreme performance in a very user-friendly package. I decided to write about dynamic hedging because I believe it’s an important concept for spread traders to understand and apply. Furthermore, I believe the way Autospreader addresses dynamic hedging with the Hedge Rule Builder tool is pretty powerful. In this post, I’ll walk through some examples to illustrate how Hedge Rule Builder can be used to apply Pre Hedge and Post Hedge rules. But before I start on that topic, I’ll back up a bit for the benefit of readers who haven’t yet taken a deep dive into spread trading and hedging. The basic function of any spread trading tool, including TT’s Autospreader, is to execute orders to buy and sell a synthetic instrument composed of at least two exchange-listed securities, or “legs”. A spreader actively quotes at least one leg. When it accumulates inventory, it “hedges” by sending orders in the other leg in an attempt to buy or sell the synthetic instrument at the desired price. Basically, a spreader performs two functions: it assumes risk, then reduces it as the spread order gets closer to completion. It provides liquidity, then seeks liquidity. 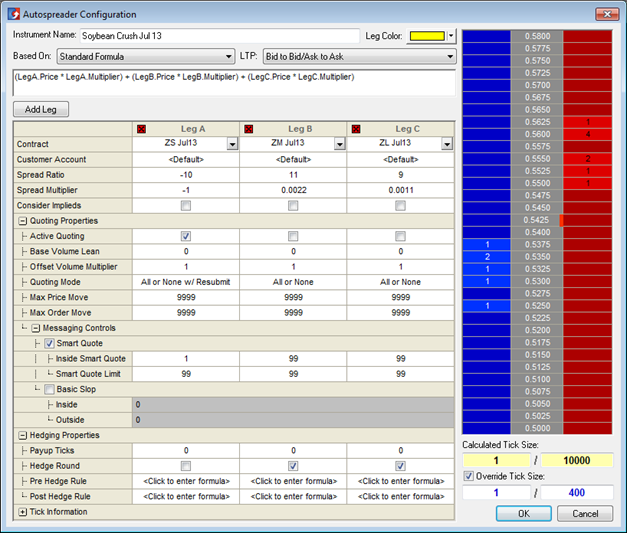 When trading a spread, hedging entails sending orders in legs as a reaction to an execution in an actively quoted leg. This is liquidity-seeking behavior, and therefore has a cost, which is mostly the price of crossing the bid-ask spread. While the main point of hedging is to reduce risk, a close second is to minimize the costs of reducing that risk. How can we try to reduce our costs of seeking liquidity? One possibility is to vary our aggressiveness based on market conditions. 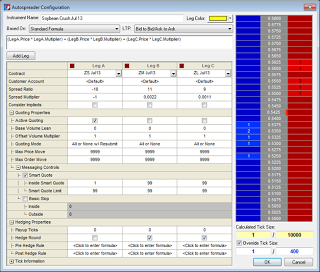 Autospreader’s Hedge Rule Builder offers two powerful ways to customize hedging behavior and aggressiveness: the Pre Hedge Rule and the Post Hedge Rule. The Pre Hedge Rule is evaluated after a quote fill but before any hedge orders are sent; the Post Hedge Rule is evaluated after hedge orders have been sent and acknowledged by the exchange. In other words, the Post Hedge Rule is only evaluated when there are “resting” hedge orders. Used together, these rules give us the opportunity to reduce liquidity costs, boosting bottom-line results. Let’s walk through a few specific liquidity-seeking techniques to illustrate the concept. After hedge orders have been sent, Autospreader can monitor market conditions and react based on user-defined logic. This allows us to continue to adjust our aggressiveness in seeking liquidity based on new information. Remember that when configuring a Post Hedge Rule, we need to provide a “repeat value” if we want the behavior to be dynamic—that is, performed more than once as conditions change. As someone who still dabbles in trading, I really appreciate the fact that the Pre Hedge and Post Hedge rules allow the user to tweak Autospreader functionality. These logic “hooks” give the trader the needed flexibility to maximize opportunity and minimize costs. These techniques are just a few examples of what is possible, and they can even be combined into more complex behaviors. If you’d like to explore some of the more sophisticated applications of Pre Hedge and Post Hedge rules, feel free to submit a comment on this blog post. Or, you can consult the Online Help module on our website.